Total solar eclipses are a unique opportunity to study the star, and also our planet, under very specific conditions. Throughout history these events have led to important scientific advances. Let’s review some of the discoveries that eclipses have given us, and take a look at what the coming one will bring us, which will be seen in the United States from coast to coast on August 21, 2017. On March 5, 1223 BC, in the port city of Ugarit, the current Ras Shamra of Syria, a total solar eclipse obscured the daytime sky for two minutes and seven seconds. We know this because the historians of the time collected this data, and described that “the Sun had hidden itself ashamed”, on a clay tablet discovered in 1948 during an archaeological excavation. It is the earliest documented solar eclipse of history. The Babylonians were by then already able to predict the eclipse dates quite well, although they attributed a divine origin to them. 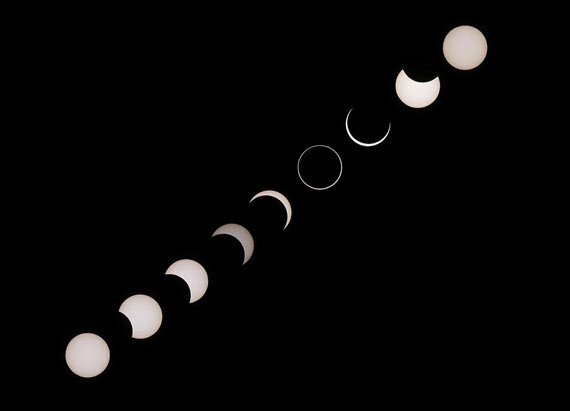 Both the Babylonians, and later the ancient Greeks, used the Saros cycle to predict eclipses. If the Moon orbited in the same plane in which the Earth orbits around the Sun, we would see a total eclipse every month. However, the Moon is inclined to that plane, so that eclipses are rare phenomena that are reproduced after 18 years, 11 days and 8 hours, which is called a Saros cycle. Each Saros cycle contains 84 eclipses: 42 solar eclipses (including total, annular and partial) and 42 lunar eclipses. The calculations of Aristarchus of Samos first and those of Hipparchus of Nicaea later, made thanks to observations during eclipses, allowed them to calculate for the first time the distance from the Earth to the Moon in 150 BC. The ancient Greeks deduced that the Moon was closer to Earth than the Sun because it passed in front of it whenever there was an eclipse. In addition they had managed to calculate the shape and dimensions of the Earth to a precision that today we know was quite accurate. From there, Hipparchus, using a method devised by Aristarchus some 120 years earlier, calculated that the Moon was 379,000 kilometres away, a very good estimate, since the actual average distance from the Moon to the Earth according to the current calculations is 384,000 kilometres. Although the ancient Chinese, Greeks and Byzantines attempted to describe and explain solar eclipses and their characteristics, it was not until the early 17th century that the German astronomer Johannes Kepler came up with the quantitative and geometric structure of the Solar System. Thanks to Kepler’s famous three laws, which define the movements of the planets, a more detailed explanation of eclipses could be given. Four hundred times closer to Earth than the Sun, the Moon is also four hundred times smaller than our star, an astronomical coincidence that makes the apparent size of the Sun and the Moon seen from Earth similar, allowing for total eclipses of the Sun, a phenomenon that occurs when the centres of the Sun, Moon and Earth are aligned. When this happens, then the ambient light weakens in full daylight, the temperature drops and one of the most shocking spectacles of nature takes place. Minutes before that moment, the Sun begins to disappear little by little, concealed by the passage of our satellite. More than a century after Kepler’s findings, the English astronomer Edmund Halley (known for the comet that bears his name) accurately predicted the time and trajectory of the solar eclipse of May 3, 1715. His calculations only deviated 4 minutes and 30 kilometres from the eclipse that actually took place. Perhaps the most famous eclipse of all time is the one that took place on May 29, 1919, because it confirmed the theory of general relativity of the German physicist Albert Einstein. According to this theory, the rays of light passing near the Sun must deviate slightly, because the gravitational field of the Sun makes the light bend. If so, this effect could only be observed experimentally during eclipses, because otherwise the brightness of the Sun does not allow us to see the affected stars. During the eclipse of 1919, the actual and apparent positions of some thirteen stars of the constellation Taurus were compared. The conclusion was conclusive: the analysis of the measurements obtained from light rays confirmed the deviation of light by the influence of the solar gravitational field, as predicted by Einstein’s theory. One of the most important theoretical predictions ever made in the history of science was verified, and only four years after the theory had been stated. During the total solar eclipse of 1836, British astronomer Francis Baily described a chain of bright points of light that appeared around the Moon in the moments before and after the maximum of the eclipse. The so-called Baily’s beads are produced by sunlight shining through the spaces between the lunar mountains. By timing and observing the moments of the contact of the first and last beads, the profile of the Moon can be reconstructed with precision. 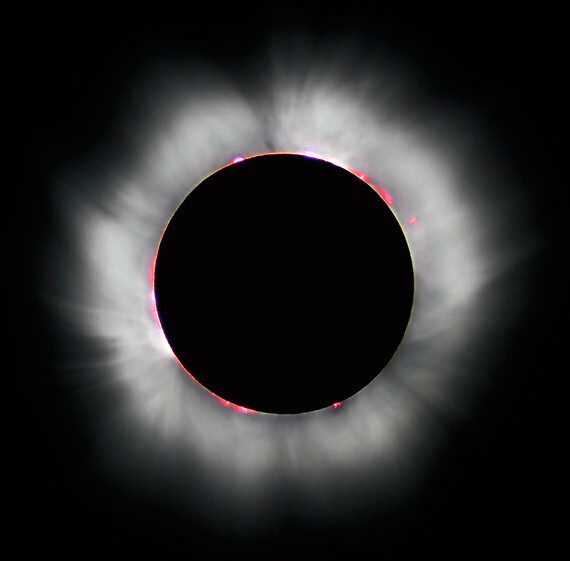 The effect which occurs at the moment at which only one bead is seen is known as the diamond ring, one of the most fascinating features of an eclipse. Another solar eclipse is also responsible for the discovery of the chemical element Helium. The first evidence of the second most abundant element in the universe was discovered by the French astronomer Jules Janssen, observing the solar corona during the total eclipse of August 16, 1868. The next eclipse on August 21, 2017, which will be observable from the west coast to the east coast of the United States, will allow scientists to continue investigating the outermost part of the Sun, its corona. It may even help unravel one of the great mysteries of astronomy: why the solar corona is hotter than the rest of the Sun. A total eclipse is a unique opportunity to study the Sun, as well as the Earth, under very special conditions. The sudden decrease in light and the drop in temperature during a total solar eclipse can affect the weather, vegetation and the behaviour of animals. This is why NASA funds 11 scientific studies that will collect data during the August 21 eclipse. We will learn about the new discoveries in the months following the event, in the shadow of the Moon.